The nanoblock Giraffe set comes in a zip-lock bag packaging, with over 130+ pieces of building blocks, and a sheet of instruction paper to show you how to build your very own giraffe. This is a "Level 2" nanoblock set, so it's relatively easy to put together. I was able to build this giraffe in about 25 minutes. The build process is quite straight forward. The only tricky part is attaching the body to the legs, so take your time and do it slowly. Here are some pics of the build process. And here is the final result. As you can see, it's a fairly accurate model of a giraffe. It definitely has the height, standing at almost 11cm tall. 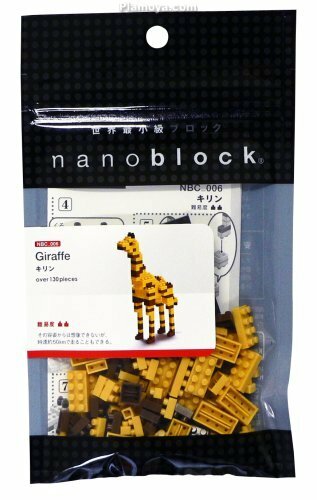 This nanoblock Giraffe retails at RM29.90, and you can get them from Toys R Us, Action City, Kinokuniya, Popular Bookshop and XL Shop in Malaysia now. You can also find it in my Amazon.com store.